Reason: The submission deadline has passed. The TCF 2nd Anniversary Shindig Submission Thread! Welcome to all 2nd Anniversary Shindig Applicants! This is the thread to submit your proposals for the contest in a post below. For more details and rules, please check out the main thread for the Anniversary Shindig. It is your responsibility to make sure that your entries fit the rules of the contest as expressed in the main thread, so please read it. As a reminder, there are no hard set categories this time around, so go nuts and submit whatever you feel like. In the case of large screenshots/images and lengthy writing, please include your post in spoilers to keep the thread easier to read. 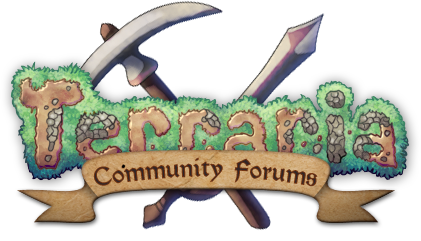 We would also ask, if you care to share, for a brief description of your entry including your concept and inspiration, and how it relates to the spirit of Terraria and/or TCF. Any non-entries posted here will be removed or deleted. If you want to discuss entries or the contest itself, please use the main contest thread. Entries will be taken until October 26th, after which the thread will be closed and all entries will be final! Deeked, rediniowa5, dashwood and 16 others like this. At a first glance, you can see the hallowed biome and the new, modded Spirit Biome. The picture represents something simple. It represents the creativity of everyone here at TCF, and our love for this awesome game that wants to make us add more to Terraria! We all have something to add, and we have opportunities to make them come alive here. It also goes to show the amount of progress the modding community has made ever since the old 1.1 days, thanks to some great members of TCF. Mackeye, Crimwolf, S0ren and 21 others like this. It was another normal day in the land of terraria. Everyone was talking and joking about, me and my fellow 3 friends were exploring, and we saw more of the underground bit by bit. But... At that night... Something strange happend. The water was red, there was floating flesh coated in blood trying to attack us and the moon was red. We all decided to call it the blood moon. Then there was enemy's coating our radar. But our defences held them off. The next morning. We felt it as though our doom approached. So we got all of our potions and our strongest equipment for fighting then went to our arena. We waited... Then it appeared! A huge beast that had the power of a god had shown itself before us. We put up a huge fight... But just as soon as we were going to die. Another appeared called "Cthulhu" and destroyed the beasts lower body. The beast made a deafening scream that unleashed a lot of evil and corrupted Cthulhu's body. Then... We fell.Suddenly, I heard a voice, the voice sounded like and was Cthulhu's. They said that they "made a new planet" and "watched my friends get taken away from the evil creatures when I was being corrupted." This made me worry but I know that they made a new planet because I heard a boom which meant I was still alive! Then I felt my body float. Then zoomed to the new planet. When I was going there Cthulhu asked me to "clean this world from the evil which that god called "Moon Lord put on it when it was being made. When I landed Cthulhu then said "I used the last of my power to get you and one of your many friends over here. Now go spyro, save everyone and save the universe by stopping Moon Lord"
TCF's Journey: A Poem (WIP) (Edit 2). A blob tried eating my face! And took out my pick. And cut down some trees. A place where I can rest. It looks like a nest. Here comes a giant eye! Running past all the trees. Knowing there's nothing to fear. Hey, what's that purple stuff? It seems to be near! I fall down a pit. The ground I have hit. That I am still alive! How much I can take! I believe I have failed. That's my attempt at showing a journey. From the beginning of TCF to it's constant developing, to now! I hope you appreciate this! Aurora3500, Noelle, Rariaz and 2 others like this. I've spent lots of time working on this mod, and I just want to be able to share it with as many people as possible! Can i say the SPIRIT of christmas? This is a 2-part video I did that fully expresses my love for Terraria. Hope you enjoy! stormconure and Teal like this. My terraria world has a tower to the heavens, a hellevator just under it, and in between both is the castle that my npcs live in, the skies, land, and underworld all have a rail system from beginning to end, both beaches have a dock, and one beach has an underwater building. I hope this is for the contest because this is my first time here. Just grabbing this so I don't forget. DemRaichu, serenesplash, SamTerarrium and 9 others like this. This is my custom steampunk airship I built, a good 30 hour project. It took a lot of planning and research on ships but I think it turned out great in the end! Here is my (potentially placeholder) entry. It's of a bunch of the people on Team Terraria 3 playing a super intense game of beach volleyball. Well... I made this like three years ago, but I guess it will do. Jon Smitten and Daikonradish like this. OddGirl, Jon Smitten, Heretic and 16 others like this. Criddle, Eris Falling, PlanteraBlade and 3 others like this. Criddle, Noelle, No mans sky and 3 others like this. we watch as something grows. he's the bringer of great fright! Heretic, Noelle and darthmorf like this. My awesome looking house in my modded world. sry the colors look wrong. 4some reason when i took the photo it came out like that. the spirit of the swords. Snickerbobble, DankySkeleton, Criddle and 6 others like this.